Once a feminist press of gritty old Portland, the small publishing house returns with a more inclusive mission. Littoral Books began in 1975 as a women’s press, founded by self-described “radical feminists” of the gritty Portland arts scene. They published two books of poetry, and paused. Forty-three years later, they’re back. Co-founders Marcia Brown and Agnes Bushell are at the helm of the press, along with Bushell’s husband, Jim. his eyes two telescopes of time turned inward. As it appeared in “Balancing Act,” published by Littoral Books in 1975, when Mills was a student at University of Maine School of Law. Age is matter of perspective. These women, young radicals in their 20s back then, still have energy – and their radical edge. 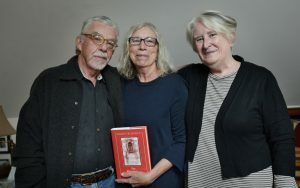 Littoral Books relaunched this summer with the publication of Agnes Bushell’s latest novel, “The House on Perry Street,” a matriarchal epic about five generations of feisty women and their involvement in the political and social events of their time. The press is soliciting poems through Sept. 30 from Maine women poets of all ages and backgrounds, including new Mainers and previously unpublished poets, for “Balancing Act 2,” a follow-up to its original anthology of poems from 1975 – a book, notably, that included two poems from current gubernatorial candidate and Maine Attorney General Janet Mills, then a law student in Portland. This time around, Littoral’s mission is more inclusive, though not necessarily less radical. Its goal is to publish books in a variety of genres by writers and artists regardless of gender or residence. Jim Bushell, recently retired from a 40-year career practicing law, serves as editor in chief. Brown is the press’s business manager and Agnes Bushell its star writer. She’s a professor emerita at Maine College of Art, and “The House on Perry Street” is her 12th novel. She also writes reviews and essays, and in 2016 received the Distinguished Achievement Award from the Maine Writers and Publishers Alliance. 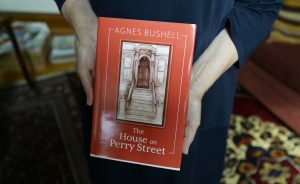 Agnes Bushell holds a copy of her latest book, a novel, “The House on Perry Street.” After a decadeslong pause, Littoral Books relaunched this summer with a new, more inclusive but still activist mission. 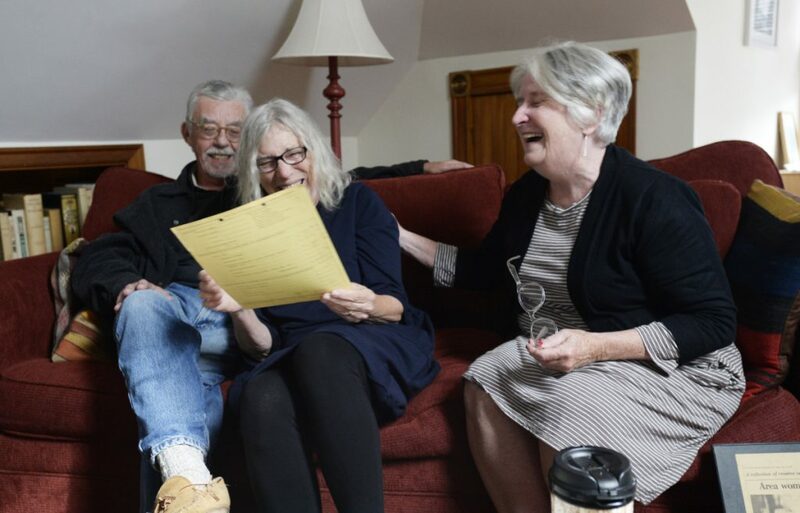 Bodwell said the old Littoral Books represented a brief but important moment in Maine’s literary history because it gave voice to people who wanted to be heard, and it helped bring writers and publishers together. Which is to say, they have a better plan. They will publish “Balancing Act 2” this fall and envision publishing a few books a year, with the hope that the success of each book will fund the next. For now, they are selling their books mostly online to save money, so they can put all of their proceeds into the next book. They are aiming to be a publisher of fine books, Jim Bushell said, and hope to give opportunities to the state’s best writers and artists. In that spirit, they used a drawing by Maine artist Judith Allen-Efstathiou for the cover of “The House on Perry Street” and illustrations by another Maine artist, Tracy Child, inside the book. 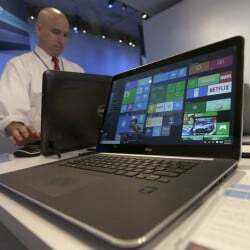 They know many novelists and short-story writers who are having difficulty getting anything published, Jim Bushell said. “We’re focused on doing books by Maine writers, Maine artists and Maine photographers,” he said. 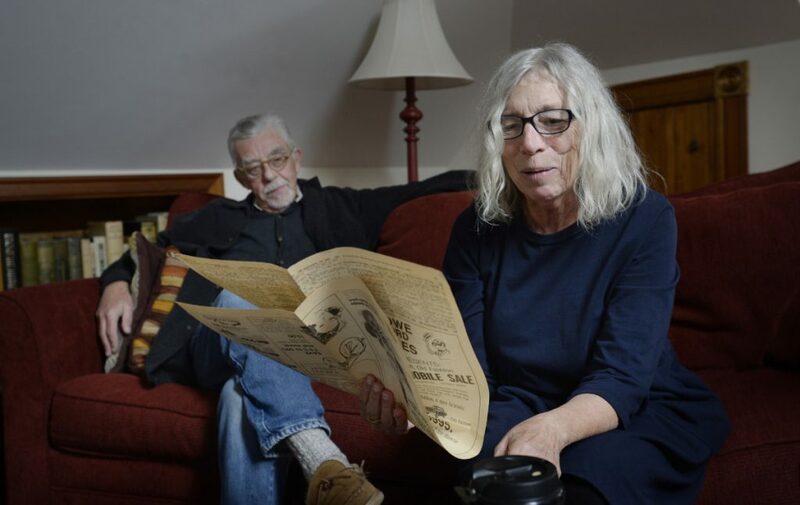 James and Agnes Bushell look over a newspaper article about their long-ago Portland press on Monday. They’re talking about a book of contemporary Maine photography, and they’ve had conversations about collecting photos and stories from the Portland of old, from the pre-gentrification days when the Old Port was gritty and the waterfront was still about fishing and making a living. Noting that the Portland Maine Encyclopedia of the 1960s, 70s & 80s Facebook group has 12,000 members, they think a print version of that concept would be both popular and valuable as a memoir and historic resource. Littoral sprung during a vibrant time in the Portland art scene. There was lots of theater, music and art, and everybody wrote poetry, Bushell recalled. Poets sold their poems on the street, or just gave them away. Bushell and Brown – then known as Marcia Ridge, before she was married – and a few other women associated with the Portland Women’s Group decided they needed a women’s press to promote women’s poetry. They had experience at underground publishing, putting out a publication known as The Rag in 1972 and the Portland Occasional Times in 1973. In 1974, they applied for a grant from the Maine State Commission on the Arts and Humanities – now the Maine Arts Commission – to publish a book of women’s poetry and were turned down. The rejection letter suggested the Portland Women’s Group lacked professional status with “many aspects of your plan” too questionable to support with public money. He goes on to say that he will be in touch to discuss the “nascent Maine Writers and Publishers Alliance.” The letter is dated May 20, 1975. “Balancing Act” sold more than 1,000 copies and earned a positive write-up from Evening Express arts writer Bob Niss. The rather bland headline on the story, “Women’s Group Publishes Poetry Book,” failed to convey the reviewer’s enthusiasm. They published a second collection, “Mustard Gas” by Frances Rugg, which also sold pretty well, and then things went dormant. Jim Bushell, recently retired from a 40-year career practicing law, is editor in chief of the new Littoral Books. Agnes Bushell, a professor emerita at Maine College of Art, is the star writer, and Marcia Brown the business manager. “We had done it for a year or two years, and then we went our separate ways,” Bushell said. But they never gave up on their vision. 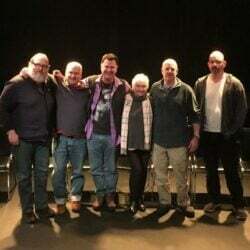 They began talking casually about relaunching the press as long ago as 2013, and those discussions got a bit of a boost in 2015 when Bodwell and the MWPA recognized Bushell and Maine poet Lee Sharkey for their roles in launching the alliance. The occasion was the alliance’s 40th anniversary, celebrated at a summer gala at writer Richard Ford’s home in East Boothbay. Bodwell hosted a public discussion with Bushell and Sharkey on Ford’s back deck. That conversation and gathering of friends sparked memories and rekindled old and dormant acquaintances. All of that happened as Bushell was writing “The House on Perry Street,” which became a nearly 400-page novel about a house in Greenwich Village and the women who lived there since it was built in 1870s. As with many of her writer friends, Bushell couldn’t find a publisher. Her agent liked the book and tried to find a home for it, but nothing happened. “The House on Perry Street” also revived a friendship from the early days of the press. Lynn Siefert, a screenwriter and producer in California best known for writing the screenplay for “Cool Runnings,” was one of the poets who contributed to the original “Balancing Act” and a co-founder of the Maine Writers and Publishers Alliance. She returned to Portland this summer, unannounced, and left a note on Brown’s door: “I’m here.” That was just as “The House on Perry Street” was coming out. The timing was too coincidental to be anything but magical, Brown said. 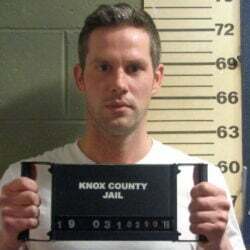 Siefert liked the book enough to option it and plans to write a screenplay, Bushell said. “So we’ll see what happens,” she said. Meanwhile, they’re working on “Balancing Act 2.” So far they’ve received about 35 submissions. They want more. There’s an editor’s prize of $100. “We really need and encourage young writers to submit, and we want new Mainers and women from northern Maine and western Maine,” Brown said. Littoral Press has been part of the lives of these women for a long time. They put it in the background for a few decades, and they’re glad to have it back out front.